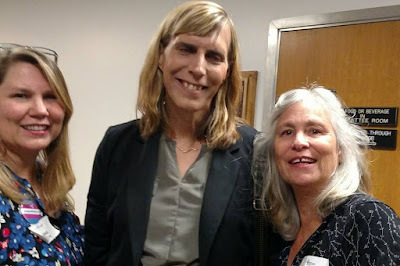 On April 4th , 2017 Dina Oskiera and I (Andi Paradise) traveled to Sacramento with Sara Kelly Keenan to the California state capitol to lobby senators on the Transportation and Housing Committee to vote in favor of state senate bill SB-179. 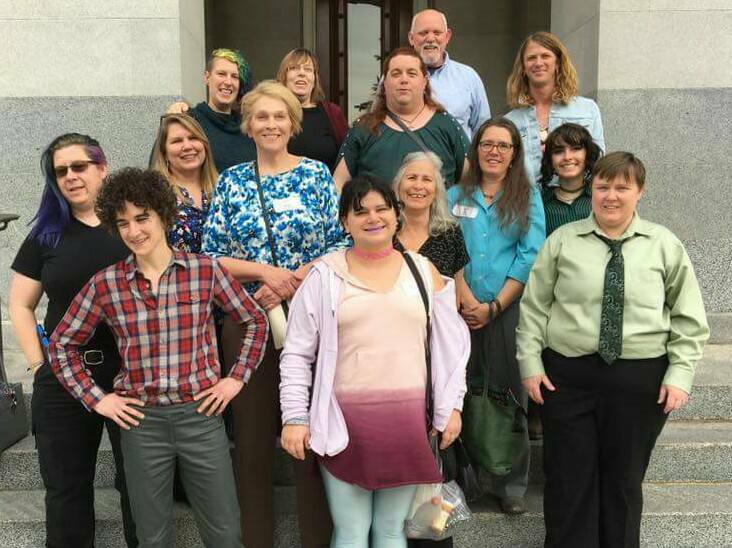 This bill was introduced by state senators Toni Atkins (D) and Scott Weiner (D) in support of the "T", "I", "Q" and "+" of the LGBTIQ+ community. You can view the bill here. 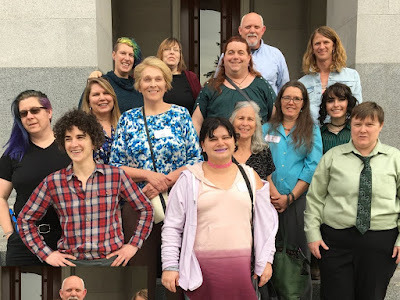 Then in the afternoon we watched the hearing from the audience as senators Atkins and Weiner, Sasha Buchert from The Transgender Law Center and Carly Mitchell from IGRP presented to the entire Transportation and Housing Committee. After their presentation several of us from the audience spoke our support for the bill, including myself and Dina, as well as a teen from Santa Cruz and her mom. This teen is now the first minor in the country to be granted non-binary status from the courts. At the end of the public comment time Sara Kelly Keenan makes a mic drop statement. Sara, another Santa Cruz resident, is the first person to ever be granted non-binary legal status (2016) in California and she is only the second in the country following Jamie Shoupe earlier in 2016. Sara was also the first person in the country (2016) to get her birth certificate legally changed to Intersex. Below is the video of the hearing. The first 10 minutes is senator presentation and witness statements by Sasha and Carly and then 5 min of public input for support starting near the 11 minute mark which includes us, the Transfamily Support Group moms and Sara Kelly Keenan's not-to-be-missed statement. The video concludes with opposition's arguments. The video wraps up with the senate Transportation and Housing Committee vote. SB-179 passed in this committee with senators voting 9 yes and 1 no. Several republicans abstained which is considered a positive sign since they didn't vote to oppose. Transportation and Housing was only the first committee the bill needs to clear in the senate. We will be back at the state capitol April 25, 2017 to do it again with the Judiciary Committee, where Sara Kelly Keenan will be a lead witness. If SB-179 passes Judiciary it moves to a vote by the entire senate. Of course that's not the end! After that it starts all over in the assembly through their redundant committees before becoming law. We are learning that the wheels of government turn slowly.